The construction of axial flow fans is influenced by a number of factors prominent amongst which is the design of the blades and their aerofoil section. This construction increases the performance for the user, with machines up to 88% of performance. However, a brief explanation of the “Aerofoil” may be useful. An Aerofoil blade section may take a variety of forms but basically it is as shown in figure A. It tapers from a comparatively blunt leading edge to a thin trailing edge. The length of the section is referred to as the chord. The shape of the mean line A-A, between the upper and lower surfaces is called the camber, and the angle at which the cross-section is set in relation to the direction of rotation is called the angle of incidence or pitch. All three factors influence performance. Pressure development is also affected by hub diameter. Generally speaking, fans with relatively large hubs develop higher pressures at the same tip speed than those with smaller hubs, though at some sacrifice of air flow. The purchase price tends to be higher with larger hubs for a given duty. For equal hub and tip diameters and equal speed, pressure development is dependent on total blade area, though a maximum limit is set by mutual interference if the blades overlap too much. The number of blades is not important; a small number of broad blades is equivalent to a large number of narrow blades having the same total chord and area. The pitch angle affects volume. A range of volumes for a given speed and diameter can be provided by different pitch angles. Figure-B illustrates a construction method that enables a variety of volumes adjusting the pitch angle. This device enables the blades to be set at any angle to give exactly the volume required. A uniform smelting in the blades allows to achieve the maximum efficiency in the fan with its streamlined profile. The mass includes an insertion in iron where the axis of the engine and the key seat is hold. All blades and the mass of the axis are smelted with “silumin”. The structure of silicon is modified based on sodium at the smelting time. The exhaust ventilation method is not only to exhaust a certain air volume per hour. In order to obtain satisfactory ventilation, the aspiration points and natural openings must be placed in a way in which the fresh air circulates throughout the full area. Ordinary examples of good and bad assembly are shown in figures 1 and 2. If both lateral walls of a building give access to the atmosphere, the simplest option would be to install in one wall helical fans vacuuming towards the atmosphere and providing air inlets in the opposite wall. If only one of the lateral walls has access to the atmosphere, a possible solution would be to use an exhaust duct throughout the internal wall as indicated in figure 3. If the distance between the side walls is considerable, it is generally better to proceed to a central exhaust. In this way, the path of the air is reduced and the probability of a short circuit decreases. This is sometimes accomplished by a central suction pipe as shown in Figure 4 but for buildings with one level, a simpler solution would be to use exhaust units mounted on the roof as seen in Figure 5. Units of this type with a helical fan generally need less capital for installation and less operating costs than a system with too long pipes. Its effectiveness is aided by convection currents directed upwards. It also avoids any interference with bridge cranes or similar equipment. On Figure 2 there is a building that is ventilated through several exhaust fans, with moderate dimensions, conveniently placed than one with high capacity. Where heat is a problem it is necessary to renew the hot air accumulated in the upper part. If this upper layer of hot air is maintained, it will gradually extend down and decrease the natural ventilation of the heated air at the working level. In such cases it is used to remove it from a high level or through the roof or end of trestles, while natural air tickets should be placed at a lower level. The faster the removal of the upper hot air is the faster the heat work area is easily removed and the incoming air is easily distributed through the area. In some cases where heavy vapors are released into the atmosphere, as in paint spray places, extractors are necessary in the ground level. This is performed because fumes are often heavier than the air. Aerofoil axial fans are found throughout the world as the most used fans and are well known for its operating safety and exceptional performance. The range of products and the wide variety of sizes and types allow uncountable applications in ventilation, air conditioning, heating, cooling, and drying systems. There are ten sizes available, ranging from 300 mm to 2410 mm diameter. The range of performance covers air volumes ranging from 350 to 250.000 m3 per hour, with a maxium water pressure of 500 mm. The application of an adjustable pitch patented impeller allows all wished combinations of volume and pressure. The simple design offers direct ventilation, facilitates installation and saves space. Cirigliano S.A. offers fans for damp, high temperatures or explosive atmospheres. Aerofoil fans for general applications have no guide vanes. The impeller rotates inside a cylindrical carcass and is mounted directly on the axis of the impeller motor. Two types of carcasses are available. Ten types of fan sizes are supplied, ranging from 300mm to 2410mm, with short type S envelopes covering only the impeller, as illustrated in the above figure. This type of carcass is usually used for coupling at the end of a ventilation system. In addition, eight types of sizes may be supplied ranging from 300 to 1520mm diameter, with long type L carcasses covering the full longitude of the impeller and motor. These are designed for air conduction. Type L envelope has an external terminal box and two register doors. The use of contra-rotative units allows to obtain substantial pressure rise. The system consists of two or more impellers with opposite handed wings rotating in opposed directions. The wings rotating in the opposed direction are coupled directly to the motors. The number of stages may be 2, 3, 4, 5 or 6. Developed pressures will be of 3, 4, 6, 7 or 9 times higher than the pressure developed by any single stage non-guide vane fan. Two-stage fans up to 1220 mm are generally supplied with the two-stages contra-rotative units in one casing but, as variant, single stage units can be used coupled in series rotating in the opposed direction. The units with downstream guide vanes have been designed to obtain medium pressures between those that are produced by single-stage and two-stage contra-rotating units of equal size and speed. 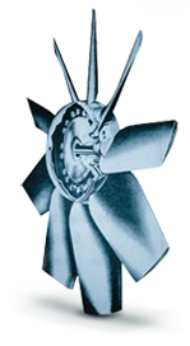 These fans are extensively used for auxiliary ventilation in mining. They may be used as multi-stage units by mounting two or more in series. Sizes available: 380, 480 mm, 610 mm and 760 mm diameter. Aerofoil fans can also be supplied with isolated motors from air current. They are used to re-circulate air with a maximum temperature of 80 C, as well as to ventilate damp atmospheres, smoke or dust. Upon demand we can supply fans able to run at a maximum temperature of 205 C. The design is usually similar to the ordinary single-stage fans but the motor is isolated in a roller from environment. Four sizes are offered: 380, 480, 610 and 760 mm diameter. The motor has an air inlet from the non-polluted environment used for cooling. For auxiliary ventilation in mining and boring work on tunnels, Cirigliano offers aerofoil two-stage contra-rotative and single-stage fans. The compact design of the fans takes up very little space and allows the direct coupling to the duct. In addition, the fan’s light weight allows hanging it in the tunnel wall. A small range of single-stage and two-stage fans will supply the means to face a wide variety of pressures. Moreover, resistant fans to explosions to work in flammable atmospheres of mines. Ranging from 300 to 1500 mm diameter in 50 and 60 hz. Appropriate for mounting as of 4500 mt above sea level. A closed circuit Aerofoil fan is designed to recirculate air in an enclosed chamber with the motor outside in enviromental atmosphere. It is particularly suitable for drying machines and refrigerating rooms, and so on. It is used for removing air up to a maximum temperature of 205 C. The fan is carried off a circular mounting plate which is bolted over a hole in the chamber roof where will be installed. The motor is placed on the external side of the mounting plate. Maxcess marine fans are designed for ship ventilation. Cirigliano´s Maxcess design allows to extract the fan from the duct system, for its service, without taking part in installations or electric connections. The fan is mounted on hinges in a protective case which is connected to the duct system. Joints between the fan and the protective case are hermetically sealed. Current taps are connected to a terminal case placed at the external side of the protective fan case. There are also external lubricators. In recent years, a great number of ships built in many countries have MAXCESS fans. Corrosion resistant Aerofoil axial fans can be supplied for fume extraction systems. The impellers are moulded in glass fibre and the outside casing is moulded in strengthen plastic. The motor and mountings are protected by a dense layer of compound resistant to corrosion. The plastic is resistant. In addition, is relatively light in weight. Four sizes of fume handling Aerofoil fans are available: 300, 380, 480 and 600 mm diameter. The performance features are the same as for standard aerofoil fans and may be converted into single-stage fan for high pressures. There are a range of fans for fume cupboards of laboratories and other types of fume systems that require small fans. Cirigliano offers fume cupboard fans resistant to corrosion. The outside of the casing is moulded with polyvinyl chloride. The impellers are moulded in plastic and the motor and accessories are hermetically sealed with a compound resistant to corrosion. Plastic connections join the fans to the pipe system. There are four sizes available: 150, 190,240 and 300 mm diameter. Performance variation includes the movement of air volumes ranging from 250 to 2.000 m3 per hour. It is particularly designed for water cooling towers and chemical industries where temperature regulation of liquids is critical. It has vanes, whose inclination angles may vary during the running of the fan. It supplies different volumes as the liquid may required for cooling.This system offers great advantages since the control is extremely accurate and superior to that obtained by fans with adjustable speed motors. A pneumatic mechanism modifies the angle of the vanes through a thermocouple or thermostat. The variation of the angle may be adjusted in the way the system requires it. Four models are offered:1.220, 1.520, 1.900 and 2.410 mm diameter. For roof extract ventilation, cirigliano´s units activated by fans have a higher performance than standard fans. Extraction speed is positive and does not vary with weather conditions as happens in standard crowls fans. Extract capacity has been determined by tests performed in accordance with international rules. The units are manufactured to provide many years of services without problems. Sizes 300/1220 mm FLOW 1700/46500 m³/h. Designed for a minimum air flow restriction with a protection cowl. The wind pressure can restrict the outlet but it is solved using these roof units. Three phase 220/380 v - 50 c.
These units are supplied for flat or inclined roofs. There are seven sizes available in which fans vary between 300 and 1220 mm diameter. Extracting capacities vary from 1020 to 40800 m per hour. Automatic locking may be coupled to reduce heat loss. The motors of the fans may be placed in such a way that may be possible to lubricate from above or below the roof. It is made of welded steel and hot galvanised. These units supply a high speed vertical flow, expelling the extracted air to a considerable height over the roof. These units are suitable for dissipation of polluted air, steam or smoke. When there is no admission resistance they are supplied with propeller fans for direct extract roof. But, in case these units constitute the final element of a duct extract system they are supplied with aerofoil fans. There are seven sizes available: from 300 up to 1220mm diameter. Exhaust capacities vary from 1530 to 39.100 m3 per hour. There is an automatic locking for environment protection. The outlet is protected with a fiber glass screen against environment. These units are aerodynamical and have a discrete design and low aluminum hood. Very popular in buildings where appearance is extremely important. Six sizes available: from 300 to 900 mm diameter. It can be coupled to propeller or aerofoil fans. Propeller extract capacity varies from 950 to 20.740 m3 per hour. Series E roof extract units are designed primarily for agricultural buildings. Low price. Easy installation. Available in four sizes from 300, 380, 460 and 600 mm diameter. Extract capacity varies from 1020 to 9350 m3 per hour. An automatic locking can be coupled to avoid downward flows. Manufactured in hot galvanised steel. Mixed volume available in 5 sizes. Range of running: from 972 to 19080 m3 per hour. Direct drive with single and triple-phase motors. There are 7 fans available for volumes ranging from 1020 to 47500 m3 per hour. Cheap and long life units-durability. A new and wide range of roof extract mixed flow units has been incorporated. It offers the best features of centrifugal and propeller fans. The mixed flow impeller has an extraordinary design with excellent pressure features and low sound level, exempt from bothering noises. It is also convenient for roof direct extract or as a final element of extract systems that require pressures of 25 mm of water or more. These units are manufactured in light weight plastic. Short in height and aerodynamic profile. Capacity varies from 950 to 19.720 m3 per hour. The range of manufacture covers fans from 190 up to 1.220 mm diameter and volumes ranging from 460 up to 53.550 m3 per hour, free unload. The quality of cirigliano propeller fans is well-known throughout the world. It has squirrel cage induction motors whose characteristics comply with all requirements of international standards in accordance with the description of our catalogue. Cirigliano propeller fans of 190 and 230 mm are mounted in a combined ring and guard cast in one piece in aluminium alloy. The holding holes in the mounting ring are fitted with rubber brushes in order dampen sound transmission. The 230mm fan has a terminal box on the mounting ring and the fan of 190 mm. The 190mm size is supplied with a 46cm lead from the motor. Fans from 300 to 1220mm diameter are normally supplied with mounting rings of pressed steel. A special feature is the elastic suspension of the impeller and motor. In order to reduce sound transmission, the mounting arms of the fans, up to a size of 920 mm diameter, are leant to rubber cushions. These fans may have flameproof and special motors for humid and high temperature places. Upon demand, when fans need to be gather together with the customer’s devices or when fans need to be installed on air ducting, these fans can be supplied without mounting rings. All sizes, except 1220mm diameter, have Cirigliano elastic suspension. Mounting transverse plates can also be supplied. Louvre shutters are opened by the fan draught and are closed when the fan stops. They reduce fan output in a 15% and are not suitable for smaller fans with slow speed fans. They are not recommended for air speeds above 5 or 6 mt per second owing to their light construction. Louvers are aluminium, mounted in a steel frame with four fixing lugs. Finish: Glossy grey. Butterfly shutters exclude backdraught with only about 5% loss of fan output. The shutter flaps are opened by fan draught and are closed when the fan is switched off. Rubber cushions prevent rattle. Shutters exposed to strong winds should be fitted with the windshield illustrated. This will reduce the fan output by a further 20%. Finish: shutter, glossy grey; windshield, galvanised. In order to protect fan outlets in exposed positions, these cowls prevent that strong winds reduce the output of the fan. They reduce air delivery by about 10%. Made from mild steel with welded seams and square fixing flanges. Finish: Galvanised. Fan chambers are correctly proportioned wrappers for mounting propeller fans in ducting. The design allows the radial air flow into and from the impeller tips. Fitted with a diaphragm plate for carrying the fan, the chamber has square fixing flanges at both ends and it is fitted with an external terminal box and two service doors. For flameproof fans, the terminal box is not fitted. Finish: Galvanised. These grilles that form a neat screen for air inlets or outlets, offer low resistance to air flow. In spite of the fact that they do not allow direct vision through the aperture, they have a free area of 60%. Square in shape with frame drilled for fixing. Finish: Glossy grey. For carrying diaphragm mounting fans when used in ducting or on heaters, coolers, etc. The size allows correct space for air flow at the impeller wing tips, ensuring full fan performance. Drilled for fan arms and for fixing. Finish: Glossy grey over red oxide anti-rust primer. Cirigliano offers five types of aerofoil small fans to cool electric devices and other works that may require small fans. These five types are manufactured in five different sizes: 96,120,150,190 and 240 mm diameter. Cirigliano offers a range of 40 fans according to its presentation, size and performance. Injection and extraction with filtrate for industrial plants. These units are used in industrial plants for injection and extraction of air where fluid filtrate is important. It has axial fans with washable and interchangeable filters and fixed shutters to avoid water entrance. Equipments with continuous services to work in weathering. Sizes available from 300 mm to 1200 mm and volumes available from 1000 m3 per hour to 100.000 m3 per hour. These small KL units are designed to be coupled directly to air ducts. Melted in aluminum. The casing covers not only the vanes but also the motor. It has an external box which connects the terminal box and oilers outside the casing. Three sizes available: 150, 190 and 240 mm diameter, covering volumes that vary from 230 to 2720 m3 per hour, free discharge. Reaching static pressures from 1,25 to 19 mm c.a. It may be applied to systems with an air temperature of -12 A +40 C.
*In addition, it has guide vanes that allow to obtain higher pressures: from 2,8 to 33 mm ca. and volumes from 240 to 2.770 m3 per hour- free discharge.